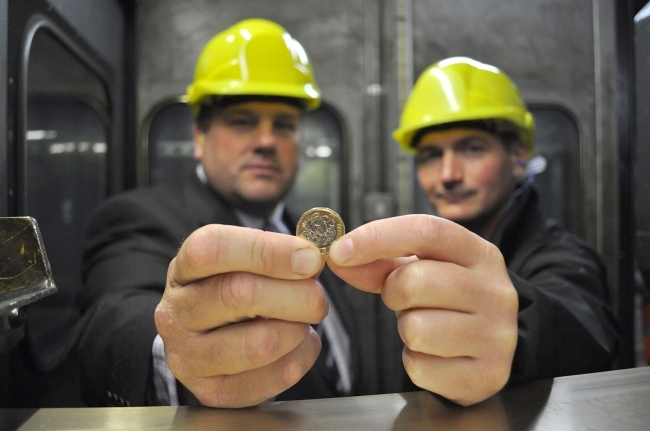 A UK-based supplier of high quality punching technology is playing a crucial role in the production of the new £1 coin. Bruderer UK, which has nearly 50 years’ experience creating world renown precision high speed presses, has installed a state-of-the-art machine into the Royal Mint’s Llantrisant facility, giving the world famous institution additional speed, capacity and flexibility. Capable of up to 825 strokes per minute, the machine is responsible for creating the hard cut blanks that form one of the first processes in the manufacture of the new ‘Pound’ coin. It also comes equipped with the latest B2 control system, meaning everything can be controlled from the Human Machine Interface (HMI), including full operation setting of the feed and speed, together with monitoring control of the whole stamping operation. “At an investment of over £1m, this is the largest single order ever placed with Bruderer UK and certainly one of the most prestigious, in recent years,” explained Adrian Haller, Managing Director. He continued: “With the tender won, we then had to complete a 3-day factory compliance test with the customer production team ensuring the machine met stringent health and safety and engineering guidelines and delivered the promised performance. Working alongside the Royal Mint, Bruderer took six months to build the machine and just three days to install the new BSTA 1600-117B2, a process that would usually take over a week. This was achieved thanks to careful planning, full co-operation of both parties and the expertise of specialist machinery handling firm Flegg Transport. It also took in initial training for more than 30 different staff, including a number of apprentices. Mervyn Evans, Engineering Manager at The Royal Mint, explained: “We are pleased to continue our long-standing relationship with Bruderer and I am delighted with the performance of the machine so far. “It is delivering the speed and accuracy we need and is a fundamental part of a production process that will eventually produce over 1.5billion pound coins. The Bruderer BSTA 1600-117B2 contains decades of experience and technological advancement to deliver a high-speed, high-performance precision stamping press. Important innovations have delivered a number of enhanced capabilities that allow the customer to adjust shut height and press speed, together with precision adjustment of the feed pitch accuracy. These can all be achieved whilst the machine is in operation, allowing the operator to maintain high levels of quality product. Bruderer UK, which employs 13 people at its headquarters in Luton and at a satellite facility in the Black Country, has enjoyed a record 12 months, with turnover set to pass £5m for the first time in its history in this country.